This year marks the 40th anniversary of China’s reform and opening up policy. It is an important year for us to look back to see how far China has come and look ahead to what the future holds for us. and what opportunities there are for China-UK economic and financial cooperation. The great journey of reform and opening up began in 1978. For 40 years since then, the Chinese people have worked tirelessly and relentlessly to extend this policy from rural areas to cities, from pilot zones to the entire country, and from economic restructuring to deeper reforms across the board. With wisdom and diligence, China has created a miracle in the world history of development. On the one hand, reform and opening up has led to historic economic and social achievements in China. On the other hand, China’s reform and opening up has profound influence on the world economy. For 40 years, China has adhered to the basic policy of opening up. From a closed and semi-closed country to one that opens up on all fronts, from a recipient of FDI to a global investor, from a late comer in the WTO to the proponent of the Belt and Road Initiative, China has been an active participant in and support of economic globalisation. In this process, China has made important contribution to the sustainable development of the world economy. and to explore and work tirelessly to blaze a path of socialism with Chinese characteristics. When China started reform and opening up, we did not have a guidebook telling us what to do. “Crossing the river by feeling the stones” is how China experimented and pressed ahead with many of its reform programmes. In the past 40 years, China started with economic restructuring and gradually moved on to the political, cultural, social and ecological areas. In this “five-pronged” reform, China has never sidestepped a problem. Our approach is to start in easier fields and gradually tackle more difficult areas. This approach to reform and opening up is in line with China’s national conditions. The people have always been at the centre of all reforms in China. This was true with the household contract system at the beginning of China’s reform and opening up. This remains true as China deepens reform across the board today. The intension and the goal of China’s reform have always been to ensure that the people live happier, safer and have a stronger sense of achievements. As China celebrates the 40th anniversary of its reform and opening up, there is no doubt that without reform and opening up, China would not have come so far. Nor would it have a bright future. Going forward, China will still need to rely on reform and opening up to achieve high-quality growth. 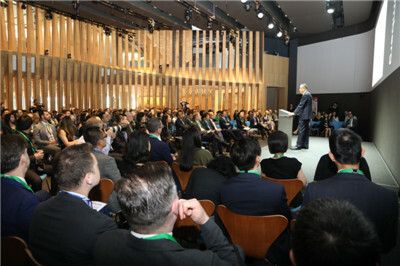 As China catches up with and begins to lead the trend of the times, opening up is a show of courage that China is ready to shoulder important global responsibilities. At the 19th National Congress of the Communist Party of China, it was clearly announced that China adheres to the fundamental national policy of opening up. China pursues development with its doors wide open . China will ease the limit on the establishment of foreign-invested financial institutions, expand the scope for their operations in China and open more areas to financial cooperation between Chinese and foreign firms. and raise the limit on foreign ownership in join-venture firms, especially in the automobile industry. Together we will embrace a more beautiful spring for the China-UK “Golden Era”! 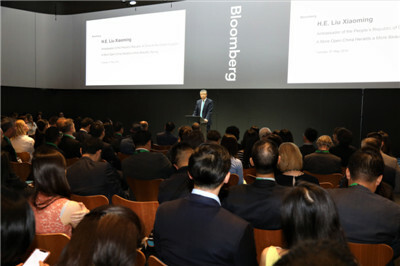 On May 8, Ambassador Liu delivered the above keynote speech at Bloomberg’s European Headquarters. 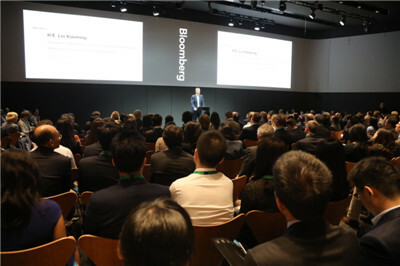 About 200 people attended the event, including Constantin Cotzias, Director of Bloomberg Europe, David Merritt, Director of Bloomberg European News, Sun Yu, Chairman of China Chamber of Commerce in the UK, and representatives from Chinese and British financial, business, and media sectors. 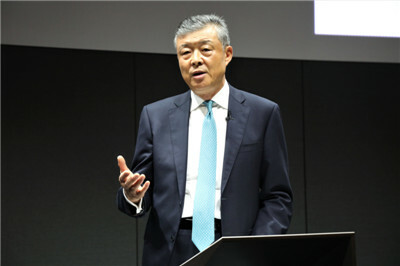 After the speech, Ambassador Liu answered questions on China-UK cooperation on trade and investment, opening up of China’s financial sector, British SMEs’ investment and business in China, and the situation on the Korean Peninsula.